New Mini parts and spares have never gone out of fashion and to be honest I don’t think they ever will. Mini adventures as the advert used to say are never going to disappear. Guess what………you are already there. What Models Do You Sell Mini Parts For? We have a huge range of parts and spares for the Mini waiting on our shelves as we speak. On this page we deal with the older classic versions of Mini, that have been driving around the streets of Essex forever. But if you are looking for the more up to date BMW Mini's then we can cater for them too, so check our page on those bits too. What If It Is A Really Hard To Get Mini Part That I Want? If you are looking for Mini items that you can't get anywhere else then you have really come to the right place. We first opened our doors way back in 1981, and have for over a quarter of a century prided ourselves on being "The" place to go for the unusual stuff. Over 30 years in the business you build up a huge network of contacts. Breakers, competitors, colleagues, mechanics and other places are all on our radar, and we use all of them to help you achieve your desire to get your Mini back on the road as soon as possible. There will be times that we can't help you, but more often than not we will come up trumps for you. So once again contact us on 01268 728309 and we can have a chat about things. 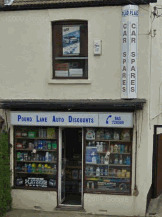 So What Kind Of Mini Parts And Spares Do You Sell? We can supply most of the items that you would want, to make your Mini fly around the streets of Essex. From clutch kits, to exhausts. From oil, air and fuel filters and service kits. To gaskets, and brake pipes. Literally you won't know what you can get for your Mini unless you give us a go. The list below highlights the parts that our suppliers can get to us the next day, or you can go on our online store and purchase directly. Whereabouts Are You Located If I Want To Visit You? As you can see from the map below we are pretty central for most places in Essex. And better still from our position just outside of Basildon, we are really close to the three main routes that cross the county. The A127, A13 and A130 are literally next door to us, which makes it an easy route from wherever you are to buy your Mini parts. For detailed driving instructions, click on the link below the image and enter your home postcode.